This site includes the following eBook of "How Girls Can Help Their Country,"
To Participate in Girl Scout Research Please Contact: Naomi Yavneh, Ph.D.
Any girl over ten years old may become a Girl Scout and she may belong to other organizations at the same time. She first ranks as Tenderfoot or third-class Girl Scout, then, after one month, she becomes, after passing certain tests, a second-class Girl Scout, and finally attains the rank of first-class Girl Scout. After she has reached the age of eighteen, a girl can become a lieutenant, and when she is twenty-one years old she may become a captain if she has passed the firstclass examinations. Girl Scouts' patrols in Europe are sometimes formed by grown-up women, who wish to curry out the Girl Scout program of preparedness, and these are called Senior Scouts. To inspect companies and patrols and advise how to conduct them according to the principles found in the Handbook. To secure the harmonious co-operation of all the captains in the district. To be the authority for recommending the issue or the denial of captains' certificates before they are sent to Headquarters. To forward the semi-annual reports to Headquarters. A Secretary. The duty of a Secretary is to be the local executive officer.She shall have charge of Headquarters and other property of the local organization. She shall have a general supervision of the captains and instruct new captains in their duties. She shall keep a record of all the troops, the names and addresses of the captains and the councilors of Girl Scouts, and such other information in regard to them as may be necessary for her work. She shall receive all the applications for Girl Scout captains' certificates and send these applications to Headquarters. Where a local council exists, all applications must be approved by the local council. She shall render a report at the regular meetings of the local board of councilors on the condition and progress of the Girl Scouts. She shall notify all the members of the annual, regular, and special meetings. She shall attend all the public meetings connected with the organization. She shall keep an itemized account of all receipts and disbursements in a book, and present a written report at the regular meeting of the board of councilors. She shall pay only those bills that have been signed by the Commissioner and Secretary. She shall make an annual report and produce the vouchers which shall be submitted to an auditor at least one week before the annual meeting. All the local organization's funds shall pass through her hands. The captain has the power to enroll Scouts and to recommend them to the local committee for badges and medals. She also has the power to release a Scout from her promise, and to withdraw her badges at any time, and to discharge her. A Scout who considers herself unjustly treated may appeal to the local council. Their decision shall be final. The captain must apply to National Headquarters for an official certificate. Her application must be accompanied by the names of two prominent citizens, and in places where a local council is established her application must be sent through the local council or court of honor and be endorsed by one member of the council. A general knowledge of the Handbook for Girl Scouts. A full appreciation of the religious and moral aim underlying the practical instruction of the entire scheme of training. Personal standing and character such as will insure a good moral influence over the girls, and sufficient steadfastness of purpose to carry out the work with energy and perseverance. Age not less than twenty-one years. A captain is assumed to have passed the first-class Scout Test. She can then wear the badge of a captain. After qualifying for the badges needed, she wears the all-round cords, if she prefers to do so, instead of putting on all the separate badges as the girls do. Captains may join the Red Cross or any other organization or club. Officers' certificates must be returned if the officer resigns or if the certificate is cancelled, as these are the property of the President. A Lieutenant: ' The duties of a lieutenant are the same as those of a captain in the absence of the captain. She is chosen by the captain to work with her, and must be over eighteen years of age. 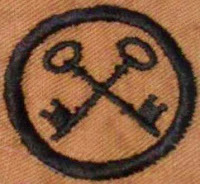 Lieutenants may wear captains' badges after passing the first-class test. A Patrol Leader is selected in each patrol by the girls themselves (or, if the girls desire it, by the captain). She holds her office for six months or a year. The girls are apt to select the right girl for the place. The patrol leader must be what her name implies, "A Leader," for she stands next to the captain and lieutenant, and takes either place in their absence. The patrol must not look upon her as a "Boss." This feeling must not enter into the patrol affairs at all, but the girls must remember that they have put her there, and they must do all they can to uphold her and support her in the work. If she is the right sort of girl no such feeling will arise. If a patrol leader gives an order that a Girl Scout does not like or think fair, the Scout must obey the order, but later on she may talk it over with her patrol leader. If, still, she is dissatisfied, she may go to her captain, who must decide the matter. If the patrol leader is not a good officer, the captain may reduce her to Scout rank and have another election. The patrol leader appoints one of her girls as a Corporal, who takes her place when she is absent, and assists her in keeping the patrol leader's books. The duties of the patrol leader are to call the roll and keep a record of attendance of her patrol. The patrol leader keeps a record of the dues. Patrol leaders' registers may be obtained at Headquarters. The patrol leader is responsible for leaving the club room in perfect order. She may have her corporal assist her in tidying up, or she may choose some girls to help her. Each patrol selects its own secretary or scribe. The duties of a secretary: To keep a record of what is done at the meetings; to receive and answer letters. Patrol Nurse. The duty of a patrol nurse is to take care of any accidents to the girls during a hike or a picnic. She should possess a first-aid kit. How to tie four of the following knots: reef, sheetbend, clove hitch, bowline, fisherman's, and sheep-shank. The name of the Governor of the State and of the Mayor of the city. Must have made a drawing of, or cut out and made in cloth or on paper, the Flag of the United States. Know how to cook one simple dish, such as potatoes or a quarter of a pound of meat. Lay a fire in stove, or light a fire in the open with two matches. Make a bed properly, and know how to make an invalid's bed. Know her own measurements (see cards at Headquarters for details of measurement). Must know the eight points of the compass. Must know what to do in case of fire. Must know remedy for poison ivy and what to do to prevent frostbite . Must know how to work a buttonhole, or knit or crochet, sew a seam and hem a garment. Must know Morse alphabet and semaphore signaling. 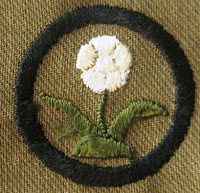 A First-Class Scout (Badge, sewn on left sleeve above elbow, which entitles the wearer to go in for all-round cords) must have gained a Second-Class Badge. Must know how to set a table properly for breakfast, dinner, and supper. Bring a shirt-waist or skirt sewn by herself or equivalent needlework. Be able to describe how to get to a specified place and walk one mile in twenty minutes. Must be able to dress and bathe a child two years old or younger. Be able to pass an examination upon the first three chapters of the woman's edition of the American Red Cross Abridged Text-Book in First Aid. Must have knowledge of signaling and of semaphore code or International alphabet (p. 75). Writing sixteen letters per minute. Must have 50 cents in savings bank earned by herself. Must produce a girl trained by herself in tests, Tenderfoot Class. Know how to distinguish and name ten trees, ten wild flowers, ten wild animals, ten wild birds. Must know simple laws of sanitation, health , and ventilation. Swim fifty yards in her clothes or show a list of twelve satisfactory good turns. Show points of compass without a compass. Must give correctly the Scouts' secret passwords. 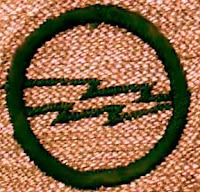 The subjects for proficiency badges may be undertaken after a girl becomes a Second-Class Girl Scout, and the interest in her work is thus continuous. The badges for proficiency are registered and are issued only by Headquarters. The ceremonial for a Tenderfoot to be invested as a Scout should be a serious and earnest function. The captain calls "Fall in." The patrol is formed in a horseshoe, with captain and lieutenant in the gap, and the American flag spread out. 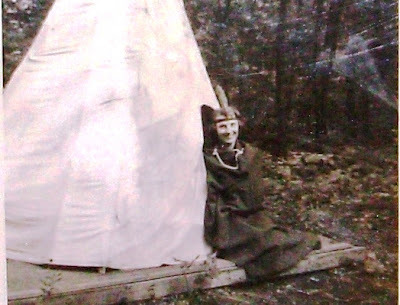 The Tenderfoot, with her patrol leader (who will already have taught her tests and knots), stands just inside the circle, opposite the captain. "Salute." All salute her. 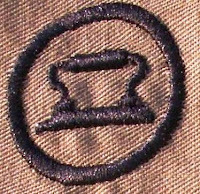 The lieutenant holds the staff and hat, shoulder-knot and badge, and neckerchief of the Tenderfoot. When ordered to come forward by the captain, the patrol leader brings the Tenderfoot to the center. The captain then asks: "Do you know what your honor means?" The Tenderfoot replies: "Yes, it means that I can be trusted to be truthful and honest"—(or words to that effect). Captain: "Can I trust you on your honor to be loyal to God and the country, to help other people at all times, and to obey the Scout Law?" The Tenderfoot then makes the half salute, and so do the whole company, whilst she says: "I promise, on my honor to be loyal to God and my country, to help other people at all times, and to obey the Scout Law." The captain then says: "I trust you, on your honor, to keep this promise." Whilst the recruit is making her promises aloud, all the Scouts remember their own promises, and vow anew to keep them. The patrol leader then steps out, gives the Tenderfoot her staff, and puts her hat, neckerchief, and knot on her. She then marches up the line to the captain, who pins on her trefoil badge, and explains that it is her Scout's "life." If, for misbehavior, her trefoil or life has to be taken from her, she becomes a dead Scout for the time the captain orders—a day or a week—and is in disgrace. The badge may be worn at all times, but the uniform is worn only when the patrol meets. The new Scout is then initiated into the mysteries of secret passwords Be Prepared (said backwards). The captain orders: "To your patrol—quick march." The whole patrol salute and shoulder staves; the new Scout and her patrol leader march back to their places. 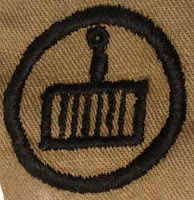 These badges being the registered designs of the Corps, do not belong to the girls who have passed the tests. The equipment does not belong to the girl except by special permission. Any person wearing Girl Scouts' badges without permission is liable to be prosecuted according to law, and may incur a penalty. Offenses, such as people who are not enrolled saluting, outsiders wearing Girl Scouts' badges, or "Monkey" patrols wearing Girl Scouts' uniforms, must be dealt with by trial at a Court of Honor to determine the forfeit or penalties to be imposed on the culprits. Captains have the power to dismiss a Scout, and the badge and the buttons of her uniform must then be returned. 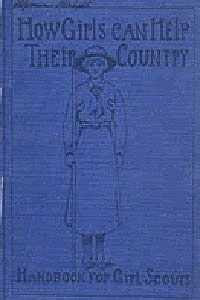 (1) To do her duty to God and her country. (2) To help other people at all times. (3) To obey the Scout law. When to Wear the Badge: A girl asked me what were the occasions on which she might wear her badge, thinking it was not for everyday use. The reply was, "You may wear your badge any day and any hour when you are doing what you think is right. It is only when you are doing wrong that you must take it off; as you would not then be keeping your Scout promises. Thus you should either take off the badge, or stop doing what you think is wrong." The "Thanks" badge may be given to any one to whom a Girl Scout owes gratitude. 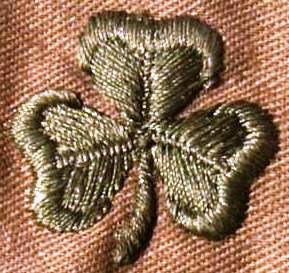 Every Girl Scout throughout the whole world when she sees the thanks badge, recognizes that the person who wears it is a friend and it is her duty to salute and ask if she can be of service to the wearer of the badge. The Bronze Cross. (Red Ribbon.) Presented as the highest possible award for gallantry, this medal may be won only when the claimant has shown special heroism or has faced extraordinary risk of life in saving life. The Silver Cross (Blue Ribbon) is given for gallantry, with considerable risk to herself. 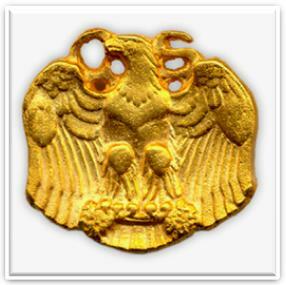 The Badge of Merit (Gilt Wreath. White Ribbon), for a Scout who does her duty exceptionally well, though without grave risks to herself, or for specially good work in behalf of the Girl Scout for especially good record one year in attend awarded when full records of such deeds accompany the claim. How to Become a ""
To secure this honor a Girl Scout must win the following badges: Ambulance and First Aid, Clerk, Cook, Child-nurse, Dairy-maid, Matron, Musician, Needlewoman, Naturalist, Sick-nurse, Pathfinder, Pioneer, Signaler, Swimmer, Athletics, Health or Civics. In examining for tests one of the Court of Honor should, if possible, be present. The Local Committee should be satisfied, through the recommendation of the girls' captain, that the tests were satisfactorily performed. A girl must become a Second Class Scout before she is eligible "for the proficiency tests. 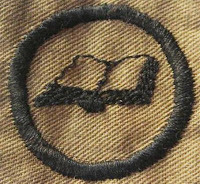 Merit badges are issued to those who show proficiency in the various subjects listed in this chapter. These badges are registered at Headquarters and are issued from no other source. The purpose of the various tests is to secure continuity of work and interest on the part of the girls. The girl who wins one of these merit badges has her interest stimulated and gains a certain knowledge of the subject. 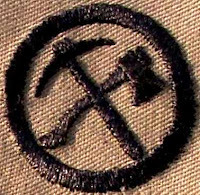 It is not to be understood that the knowledge required to obtain a badge is sufficient to qualify one to earn a living in that branch of industry. 1. What to do in case of fire. 2. How to stop a runaway horse. 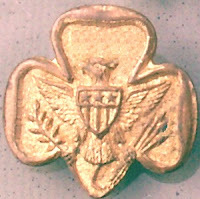 To obtain an artist's badge a Girl Scout must draw or paint in oils or water colors from nature; or model in clay or plasticine or modeling wax from plaster casts or from life; or describe the process of etching, halftone engraving, color printing or lithographing; or Arts and Crafts: Carve in wood; work in metals; do cabinet work. 1. Write a 500-word article on value of Athletics to girls, giving proper method of dressing and naming activities most beneficial. 2. Be a member of a gymnasium class of supervised athletics or a member of an active team for field work. 3. Understand the rules of basket ball, volley ball, long ball, tether ball, tennis and captain ball. 4. Must be able to float, swim, dive and undress in water. 5. Know and be able to teach twenty popular games. 4. Attendance. (Annual.) (Badge, Silver Star.) Must complete one year of regular attendance. Must complete one year of regular attendance. 1. Must pass an examination equal to that required to obtain a permit or license to operate an automobile in her community. 2. Know how to start a motor and be able to do it and be able to explain necessary precautions. 3. Know how to extinguish burning oil or gasoline. 4. Comply with such requirements as are imposed by body conducting the test for licensing drivers. 1. Have a knowledge of the theory of the aeroplane, helicopter, and ornithopter, and of the spherical and dirigible balloon. 2. Have made a working model of any type of heavier than air machine, that will fly at least twenty-five yards; and have built a box kite that will fly. records made by famous aviators. 4. Have a knowledge of names of famous airships (dirigibles) and some of their records. 5. Understand the difference between aviation and aerostation, and know the types of apparatus which come under these two heads. 1. Give list of 50 well-known wild birds of United States. 2. State game bird laws of her State. 3. Give list of 50 wild birds personally observed and identified, in the open. 4. Give list of 10 wild birds sold as cage birds. 5. Name 10 birds that destroy rats and mice. 7. Give name and location of 2 large bird refuges, explain the reason for their establishment and the birds they protect. 8. Tell what the Audubon Society is and how it endeavors to conserve the birds of beautiful plumage. 1. Be able to tie six knots. 2. Be able to row, pole, scull, or steer a boat. 3. Land a boat and make fast. 4. State directions by sun and stars. 5. Swim 50 yards with clothes and shoes on. 6. Box the compass and have a knowledge of tides. 1. Take care of a child for two hours each day for a month, or care for a baby for one hour a day for-a month. 3. Should understand care of children, have elementary knowledge as to their food, clothing, etc. 4. Know three kindergarten games and describe treatment of simple ailments. 5. Be able to make poultices, and do patching and darning. 1. Must have legible handwriting; ability to typewrite; a knowledge of spelling and punctuation; a library hand; or, as an alternative, write in shorthand from dictation at twenty words a minute as a minimum. 2. Ability to write a letter from ' memory on a subject given verbally five minutes previously. Knowledge of simple bookkeeping and arithmetic. Keep complete account of personal receipts and expenditure for six months. 1. Be able to recite the preamble to the Constitution. 2. Be able to state the chief requirements of citizenship of a voter, in her state, territory or district. 3. Be able to outline the principal points in the naturalization laws in the United States. 4. Know how a president is elected and installed in office, also method of electing vice-president, senators, representatives, giving the term of office and salary of each. 5. Be able to name the officers of the President's Cabinet and their portfolios. 6. The number of Justices of the Supreme Court of the United States, the method of their appointment and the term of office. 7. Know how the Governor of her state, the lieutenant-governor, senators and representatives are elected and their term of office. Also explain the government of the District of Columbia and give the method of filling the offices. 8. Know the principal officers in her town or city and how elected and the term of office. 9. Know the various city departments, and their duties, such as fire, police, board of health, charities and education. 10. Be able to name and give location of public buildings and points of interest in her city or town. 11. 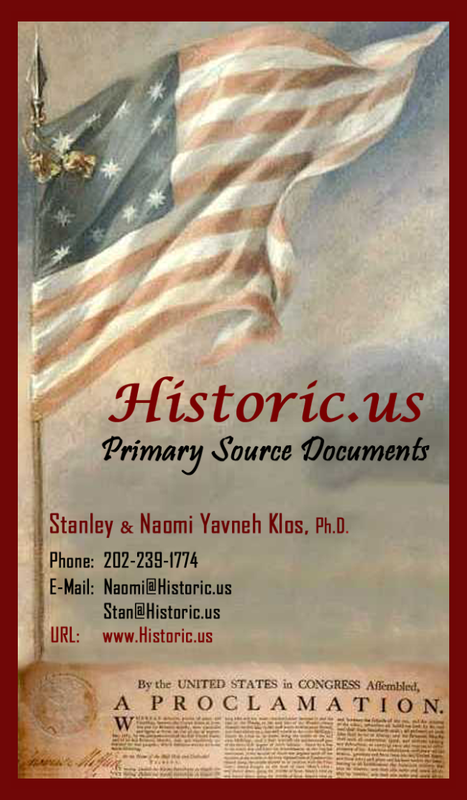 Tell the history and object of the Declaration of Independence. 1. Must know how to wash up, wait on table, light a fire, lay a table for four, and hand dishes correctly at table. 2. Clean and dress fowl. 4. How to make a cook place in the open. 5. Make tea, coffee or cocoa, mix dough and make bread in oven and state approximately cost of each dish. 6. Know how to make up a dish out of what was left over from the meals of the day before. 7. Know the order in which a full course dinner is served. 8. Know how to cook two kinds of meat. 9. B oil or bake two kinds of vegetables successfully. 10. How to make two salads. 11. How to make a preserve of berries or fruit, or how to can them. 1. How to make gruel, barley water, milk toast, oyster or clam soup, beef tea, chicken jelly, and kumyss. 2. Be able to mend a tire. 5. Read a map properly. 6. Know how to make reports if sent out scouting on a road. 3. Pledge herself to give the services of her bicycle to the government in case of need. 4. If she ceases to own a bicycle, she must return the badge. 4. Know how to do general dairy work, such as cleaning pans, etc.. sterilizing utensils. 5. Know how to feed, kill, and dress poultry. 6. Test five cows for ten days each with Babcock Test and make proper reports. 1. Illustrate the experiment by which the laws of electrical attraction and repulsion are shown. 2. Understand the difference between a direct and an alternating current, and show uses to which each is adapted. Give a method of determining which kind flows in a given circuit. 3. Make a simple electro-magnet. 4. Have an elementary knowledge of the construction of simple battery cells, and of the working of electric bells and telephones. 5. Be able to replace fuses and to properly splice, solder, and tape rubber-covered wires. 6. Demonstrate how to rescue a person in contact with a live electrical wire, and have a knowledge of the method of resuscitation of a person insensible from shock. 1. Incubating chickens, feeding and rearing chickens under hens. 4. Swarming, hiving and use of artificial combs. 1. Participate in the home and school garden work of her community. 2. Plan, make and care for either a back-yard garden, or a window garden for one season. 3. Give plan of her work, the flowers or vegetables planted, the size and cost of her plot and the profit gained there from. 4. She must also supervise or directly care for the home lawns, flower beds; attend to the watering, the mowing of the grass, keeping yards free from waste paper and rubbish, to the clipping of shrubbery and hedges. 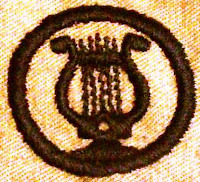 This test is open to scouts already in the Girls' Garden and Canning Clubs throughout the country and a duplicate of their reports, sent in for their season's work, to the state agricultural agents, or agricultural colleges, in co-operation with the Department of Agriculture of the United States, may be submitted as their test material for this badge. Farmers' Bulletins, 218, 185, 195. 1. Eat no sweets, candy, or cake between meals for three months. 2. Drink nothing but water, chocolate, or cocoa for a year. 3. Walk a mile daily for three months. 4. Sleep with open window. 5. Take a bath daily for a year, or sponge bath. 6. Write a statement of the care of the teeth, and show that her teeth are in good condition as a result of proper care. 7. Tell the difference in effect of a cold bath and a hot bath. 8. Describe the effect of lack of sleep and improper nourishment on the growing girl. 9. Tell how to care for the feet on a march. 10. Describe a good healthful game and state its merits. 11. Tell the dangers of specialization and overtraining in the various forms of athletics, and the advantages of an all-around development. 12. Give five rules of health which if followed will keep a girl healthy. 2. Tell how to cleanse and purify a house after the presence of contagious disease. 3. State the laws of her community for reporting contagious disease. 4. Tell how a city should protect its supplies of milk, meat and exposed foods. 6. Tell how her community cares for its garbage. 7. State rules for keeping Girl Scout camp sanitary —disposal of garbage, rubbish, etc. 1. Demonstrating riding at a walk, trot and gallop. 2. Know how to saddle and bridle a horse correctly, and how to groom a horse properly. 3. Know how to harness correctly in a single or double harness, and how to drive. 5. State lighting up time, city law. 1. Must pass tests recommended by First Aid Department of the American Red Cross. These tests may be had from Headquarters, upon request. 2. Know how to make invalid's bed. 3. Know how to take temperature; how to count pulse and respirations. 1. Tell how a house should he planned to give efficiency in housework. 2. Know how to vise a vacuum cleaner, how to stain and polish hardwood floors, how to clean wire window screens, how to put away furs and flannels, how to clean glass, kitchen utensils, brass and silverware. 3. Marketing. Know three different cuts of meat and prices of each. Know season for chief fruits and vegetables, fish and game. Know how flour, sugar, rice, cereals and vegetables are sold; whether by packages, pound, or bulk, quarts, etc. 4. Tell how to choose furniture. 5. Make a list of table and kitchen utensils, dishes for dining-room and glasses necessary for a family of four people. 6. How to make a fireless cooker, small refrigerator and window box for winter use. 7. Prepare a budget showing proper per cent of income to be used for food, shelter, clothing, savings, etc. 1. Be able to carry on a simple conversation in any other language than her own. 2. Write a letter in a foreign language. in any other language than her own. 1. Know how to wash and iron a garment, clear starch and how to do up a blouse. 2. Press a skirt and coat. 1. Pass tests in judging distances, 300 to 6Qd yards and in miniature rifle shooting, any position, twenty rounds at 15 or 25 yards, 80 out of 100. 2. Know how to load pistol, how to fire and aim or see it. 3. Be proficient in fencing or archery. 1. Know how to play a musical instrument. Be able to do sight reading. Have a knowledge of note signs and terms. 2. Name two master composers and two of their greatest works. 3. Be able to name all of the instruments in the orchestra in their proper order. 1. Have a knowledge of singing. Have a pleasing voice. 2. Know two Scout songs and be able to sing them, or lead the Scout Troop in singing. 3. Be able to do sight reading. 4. Have a knowledge of note signs and terms. 1. Sound correctly on a Bugle the customary army calls of the United States. 1. Make a collection of sixty species of wild flowers, ferns and grasses, and correctly name them. 1. Colored drawings of wild flowers, ferns or grasses drawn by herself. 2. Twelve sketches or photographs of animal life. 1. Know how to cut and fit. How to sew by hand and by machine. 2. Know how to knit, embroider or crochet. 3. Bring two garments cut out by herself; sew on hooks and eyes and buttons. Make a button-hole. 4. 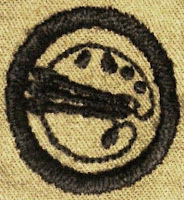 Produce satisfactory examples of darning and patching. 1. Know the topography of the city, all the public buildings, public schools, and monuments. 2. Know how to use the fire alarm. 3. In the country know the country lanes and roads' and by-paths, so as to be able to direct and guide people at any time in finding their way. 4. Know the distance to four neighboring towns and how to get to these towns. 5. Draw a map of the neighborhood with roads leading to cities and towns. 6. Be able to state the points of the compass by stars or the sun. 1. Tie six knots. Make a camp kitchen. 2. Build a shack suitable for three occupants. 1. Know use of lens, construction of camera, effect of light on sensitive films and the action of developers. 2. Be able to show knowledge of several printing processes. 3. Produce 12 photos of scout activities, half indoor and half outdoors, taken, developed and printed by herself, also 3 pictures of either birds, animals, or fish in their natural haunts, 3 portraits and 3 landscapes. 1. Must present a certificate from teacher of her school, showing a year's record of excellence in scholarship, attendance and deportment. 2. Describe in an article, not to exceed a thousand words, how a newspaper is made; its different departments, the functions of its staff; how the local news is gathered; how the news of the world is gathered and disseminated. 3. Define briefly a news item. 4. Define briefly an editorial. 5. Define briefly a special story. 6. Tell how printer's ink is made. 7. Tell how paper is made. 8. Describe evolution of typesetting from hand composition to machine composition. 9. Write 12 news articles (preferably one a month), not to exceed 500 words each, on events that come within the observation of the Scout that are not public news, as for instance, school athletic events, entertainments of Scouts, church or school, neighborhood incidents. 10. Write a special story on some phase of scout- craft, a hike, or camping experience, etc. 1. Write a good poem. 2. Write a good story. 3. Know principal American authors of prose and verse in the past and present century. Send and receive a message in two of the following systems of signaling : Semaphore, Morse. Not fewer than twenty-four letters a minute. Receive signals by sound, whistle, bugle or buzzer. 1. Swim fifty yards in clothes, skirt and boots. 6. Saving the drowning. Requirements for examination must be sent to parents of candidate for approval. Approval must also be obtained from the family physician or some other doctor.